► SOUTH AFRICA: Condor begins seasonal Frankfurt - Cape Town ops from mid October. German charter carrier, Condor Flugdienst (DE), will commence its seasonal operations between Germany and South Africa, starting October 16 and ending April 22. The twice weekly flights will operate using a wingletted B767-300ER. ► ANGOLA: Lufthansa switches Luanda to A330 ops from late October. German carrier, Lufthansa (LH), will, from 27OCT13, switch its operational aircraft in use between Frankfurt and Luanda from Airbus A340-300 aircraft to A330-300. Capacity remains unchanged despite the aircraft adjustment. ► TUNISIA: SunExpress launches weekly Enfidha - Frankfurt flights. SunExpress (XQ), the Turkish based scheduled and charter operator, launched a once weekly flights between Enfidha, Tunisia and Frankfurt on Friday, May 3. ►► NAMIBIA: Air Namibia to axe Accra, reduces Cape Town, Joburg due to low demand, Frankfurt due to A340s undergoing maintenance. [UPDATE 7 APRIL] Air Namibia (SW) is, according to Amadeus, to axe its Windhoek - Accra (Ghana) flights effective 10 April. In addition, Windhoek to Cape Town, and Windhoek to Johannesburg flights are to be reduced from 3 to 2 a day, with Windhoek to Frankfurt flights being reduced to 4x a week effective immediately. ►► ETHIOPIA: Lufthansa reduces Khartoum, Addis Ababa flights from 31 March. [UPDATE 21 MARCH] German carrier Lufthansa (LH) is to reduce operations on its route between Frankfurt and Addis Ababa, Ethiopia via Khartoum, Sudan effective between 31 March and 1 June. ■ NAMIBIA: Air Namibia settles its bill with Engen; Frankfurt nonstop resumes. Air Namibia's (SW) has settled its outstanding debt with fuel supplier, South African based Engen. Fuel bills have continuously hurt the Namibian national carrier's coffers with an estimated 40% of revenue going to fuel related expenses alone. ► ETHIOPIA: Ethiopian Airlines extends 787 cancellations until late April. AirlineRoute reports that, as per the 08MAR13 GDS timetable and inventory display, Ethiopian Airlines (ET) is to extend its Boeing 787 service cancellations until 30APR13 inclusive. Due to aircraft redeployment, a number of routes will also see aircraft changes, scheduled to be in effect until mid-June 2013. ► CONGO (BRAZZAVILLE): Launch of Air CEMAC delayed once more; this time until late 2013. As prognosticated by The African Aviation Tribune in November 2012, Air CEMAC, the planned regional carrier to link Cameroon, the Central African Republic, Congo (Brazzaville), Gabon, Equatorial Guinea, Chad and São Tomé & Príncipe, has indeed been forced to delay its intended January 2013 launch date, this time, to November/December 2013. ► ETHIOPIA: Ethiopian Airlines' 787 timetable for Beijing, Frankfurt, Toronto, Washington DC announced. AirlineRoute reports that as per the 11 January 2013 GDS timetable and inventory display, Ethiopian Airlines (ET) will continue to tweak its planned Boeing 787 long haul service between now and late-March 2013. ► GERMANY: Air Namibia reduces its Frankfurt service from late January to March 2013. Air Namibia (SW) has announced it is to reduce its frequencies to Frankfurt, Germany from daily to 5x weekly over the period 19 January 2013 - 17 March 2013 as a result of reduced demand. The carrier is to drop its Day 2,6 service from Windhoek to Frankfurt and its Day 3,7 services from Frankfurt to Windhoek. ► ETHIOPIA: Ethiopian announces 787 operational changes for Q1 2013. Online aviation resource AirlineRoute states that Ethiopian Airlines (ET) is to apply further changes to its planned Boeing 787 operation over the coming three months. ► NAMIBIA: Air Namibia announces numerous changes to its timetable from October onwards. As part of their strategy of efficient utilisation of their aircraft, Namibian carrier Air Namibia (SW) have again announced various changes to both their regional and international network, effective from October 2012 (the precise dates are subject to each individual post). ► GERMANY: Eritrean Airlines drops Frankfurt 6 months after its inaugural flight. Eritrean Airlines (B8), the Eritrean national carrier, has announced that effective 1 October 2012, it will drop Frankfurt, Germany from its route network. The route is currently serviced once weekly via Rome, Italy using an Airbus A319, down from its original 3x weekly frequency when the route was inaugurated in April. ► GERMANY: Lufthansa announces Africa schedule changes for European Winter. 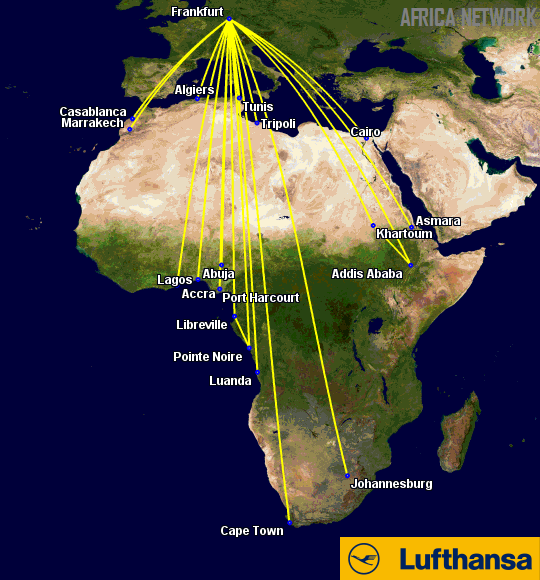 German carrier Lufthansa (LH) has announced various operational and frequency changes to its Africa network for the duration of the European winter of 2012/2013. Frankfurt – Johannesburg, South Africa: 08 January 2013 – 30 January 2013 - Service reduces from daily to 6x weekly. Frankfurt – Khartoum, Sudan – Addis Ababa, Ethiopia: Service to operate 6x weekly instead of planned daily. Frankfurt – Lagos, Nigeria – Port Harcourt, Nigeria: 16 January 2013 – 06 February 2013 Service reduces from daily to 6x weekly. Munich – Cape Town, South Africa: Effective 28 October 2012 - Service to switch from Frankfurt to Munich due to Frankfurt Noise Abatement rules.